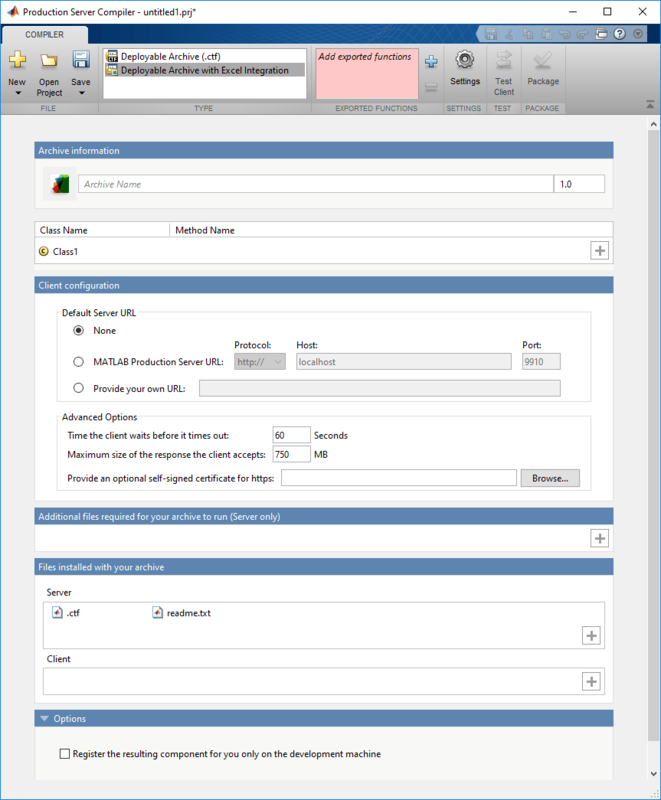 The Production Server Compiler app tests the integration of client code with MATLAB® functions. It also packages MATLAB functions into archives for deployment to MATLAB Production Server™. MATLAB Toolstrip: On the Apps tab, under Application Deployment, click the app icon. MATLAB command prompt: Enter productionServerCompiler. Type of archive to generate as a character array. Functions to package as a list of character arrays. Name of the archive as a character array. Files that must be included with archive as a list of files. Optional files installed with archive as a list of files. Flags controlling the behavior of the compiler as a character array. Folder where files for testing are stored as a character array. Folder where files for building a custom installer are stored are stored as a character array. Folder where generated installers are stored as a character array.